Nine’s first Ironman presence kicks off this Sunday with a “reality series” (branded entertainment?) Ironman: Deep Water ahead of the first Ironman event in January. Six of Australia’s toughest Ironmen will compete for $100,000 in prizemoney when they take on extreme challenges over eight weeks in Deep Water, Channel Nine’s epic new reality series premiering Sunday, October 13, at 4.30pm. Deep Water is hosted by Ironman legend Zane Holmes and big wave surf rider Wes Berg. 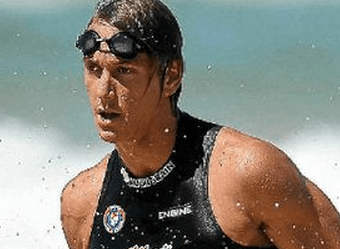 Together they will issue a series of individual and team challenges to the biggest names in Ironman competition: Shannon Eckstein, Matt Poole, Caine Eckstein, Kendrick Louis, Tanyn Lyndon and Ky Hurst. Although used to tough physical challenges in competition, how will these six supreme athletes fare when taken outside their comfort zone to tackle extreme tasks in places they’ve never ventured to? The challenges include high cliff jumping, rock running, racing over razor-sharp reefs, the “lung buster” (underwater swimming races) and finally “the gorge”, where they run in 50-degree heat through the rough terrain of remote Carnarvon Gorge in Central Queensland. The Deep Water series is a prelude to the Nine Network’s exclusive broadcast of the world-renowned Nutri-Grain IronMan and IronWoman Series starting January 18, 2014.